There are things we didn’t like about the current choices of handgun silencers. And you probably have the same gripes. Most of us have lived with these problems, assuming them as reality. Not even realizing that silenced life could be better… seamless even. The fact is, most people don’t shoot their handguns suppressed all of the time. But when you do, you want taller sights for a better sight picture. You also don’t always want an extra 10 inches sticking off the end of your barrel. But the shorter offerings may not be quiet enough for you. Forcing you to choose between optimal silence and maneuverability. The Odessa-9 features a 1.1″ tube, allowing you to fully utilize your stock sights. That’s right, the Odessa-9 is almost as small as our Mask. It is also fully modular and can be shot in multiple configurations. 11 to be exact (well, 12 if you don’t use ANY baffles). 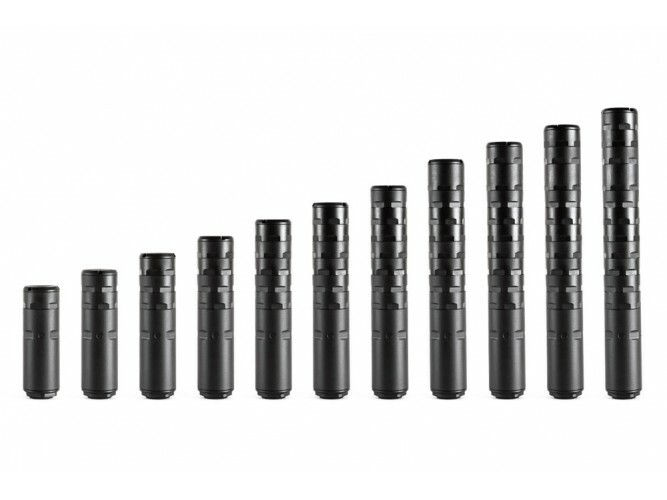 If you stack only four baffles you’ll be close to, or below, hearing safe levels with subsonic ammunition. Stack on the full 11 baffles and we’ve hovered just shy of 122dB with HUSH subsonic ammo. 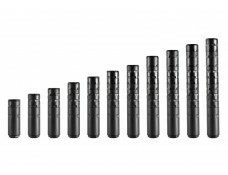 With the smaller tube and this much modularity, your suppressed handgun life just got easier. The Odessa-9 is compatible with legacy pistons such as those from Silencerco and Rugged Suppressors. Length (With Piston / Without): 8.59" / 8.50"
Weight (With Piston & Spring / Without): 10.6 oz. / 8.75 oz.